This is the latest in an occasional series of data models based upon the packaged application we support with our Safyr product. Many of our customers and partners are increasingly using Salesforce as an enterprise system of record and of course with the addition of customisations and applications the data model is increasing in size and complexity, meaning that it is becoming more difficult to manage, maintain and understand. The Salesforce Schema Builder is a great feature, but not wonderful for larger models, so this shows an alternative approach. The model could have been created just as easily in any of the export formats we support (ER/Studio, ERwin, PowerDesigner….) 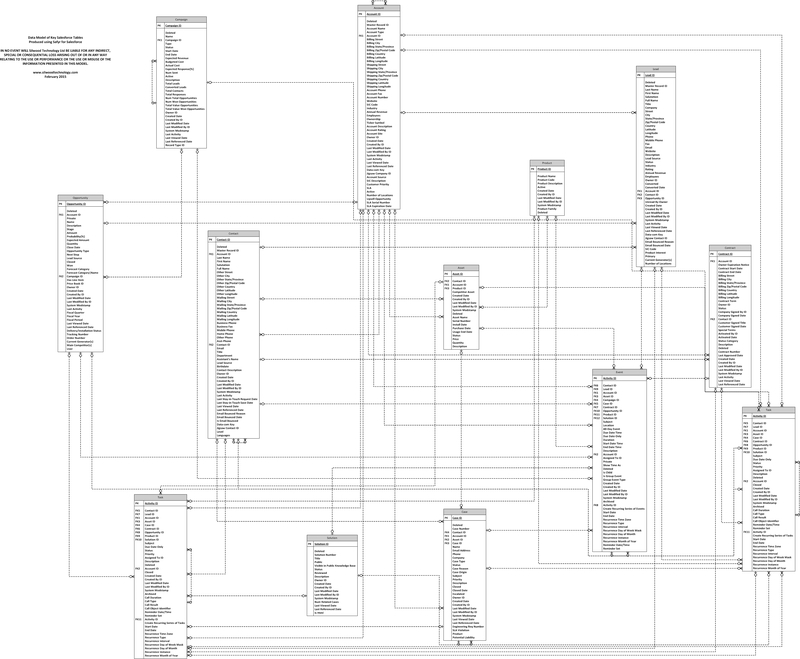 but most people have Visio so it’s an easy option for this kind of exercise. Note that you will need Visio 2010 or earlier as Microsoft removed some very useful functionality to do with Data Models in Visio 2013. So with this in mind, and for those of you who do not have Visio, the model is also available for download here as a jpeg. If you would like to see the same data in other modelling formats (for ERwin, ER/Studio, PowerDesigner etc.,) please let me know. I hope the model is useful. Please let me know what you think. This entry was posted in Data, Data and Application integration, Data Discovery, Data Model, Enterprise Metadata Management, Metadata discovery, MIcrosoft Visio, Safyr, Salesforce and tagged Cloud integration, data, Data Discovery, data model, Enterprise Information Management, metadata, Salesforce, visio. Bookmark the permalink.